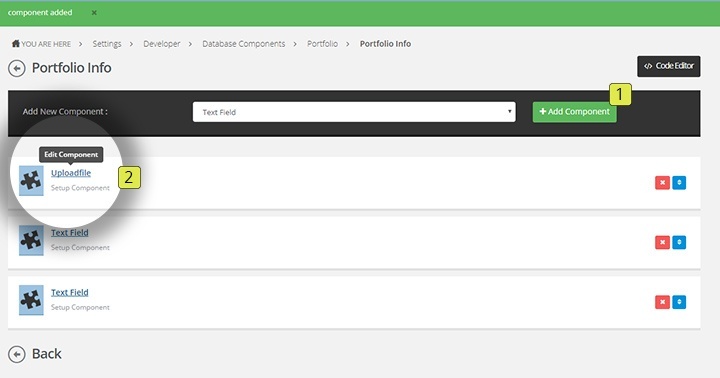 In this example we are going to build a very simple detail page for our portfolio database. We are also going to prepare the input fields for our database list (see next article). Go to the Developer start page and click database components. Click on the name of your component. Add a single item to the form of your component. It is very important that you pick a single normal item. Only these variables can be used when building our database list later. 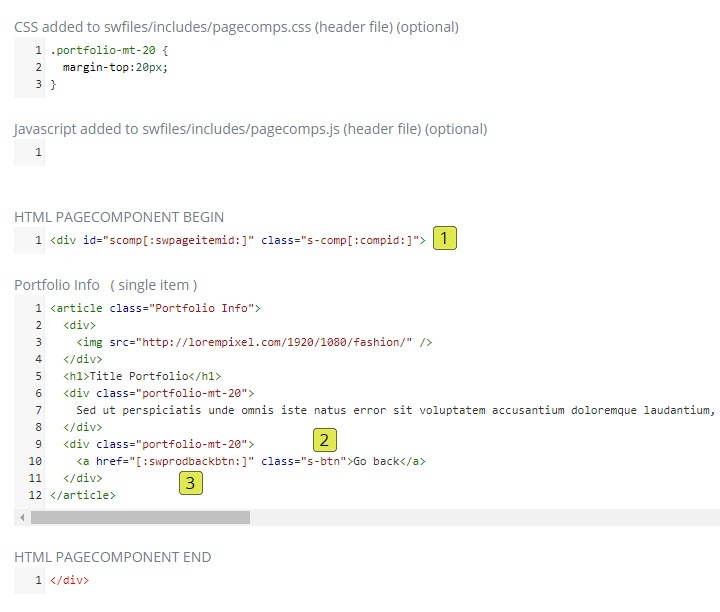 We are going to add HTML code to our component. 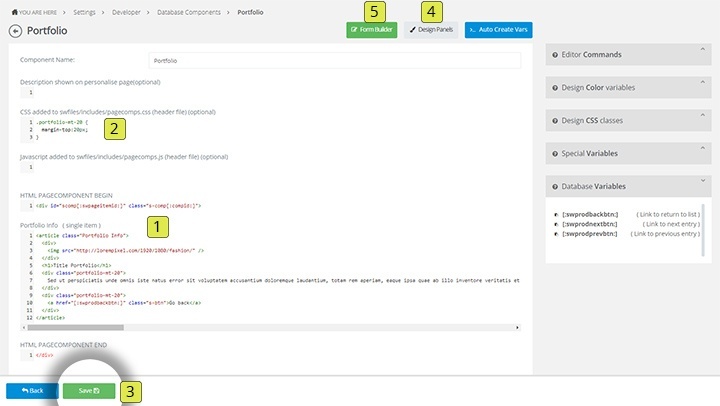 Next we are going to add our static html code in the code editor. (5) Go back to the form builder we are going to add input fields to the form to replace our static code. (1) id scomp[:swpageitemid:] and class s-comp[:compid:] is used for the design panels and is needed to create instances. See article about design panels. In the form builder click on the item we created in step 2. Add the input fields we need for this example. 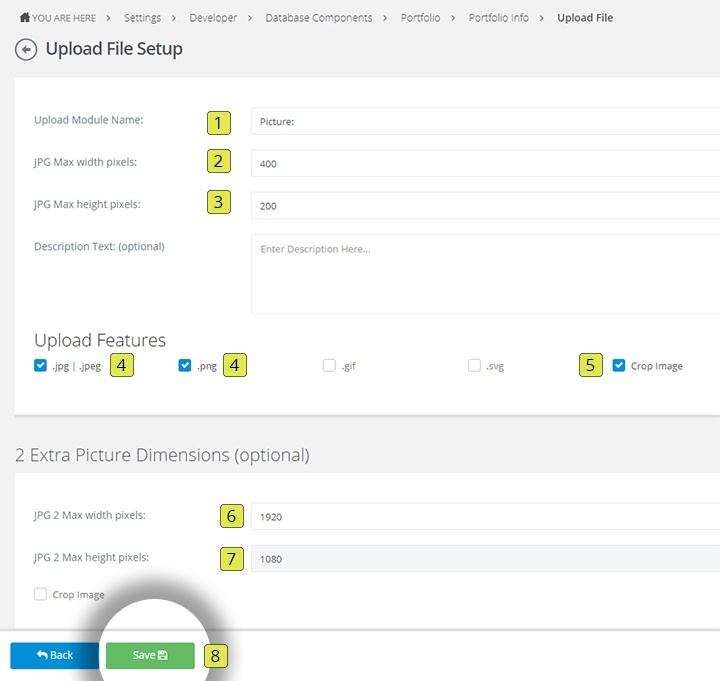 (1) Click add component to install 1 uploadfile and 2 text fields. Picture upload file setup. We are going to upload a picture and we need two dimensions. One for the database list tile we are going to create in the next article and one big format for our detail page. (4) Select the available extensions for the file. Add a single input line for the title. Add the texteditor for the content copy. 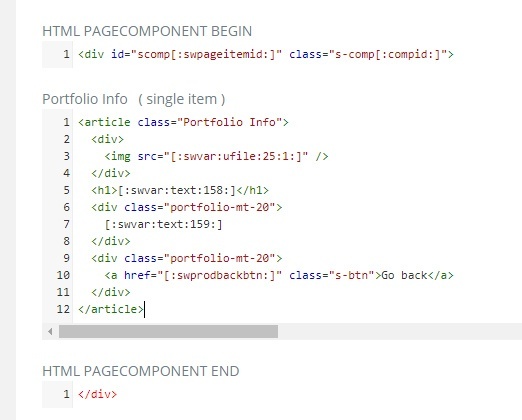 Click back to return to the Component overview. 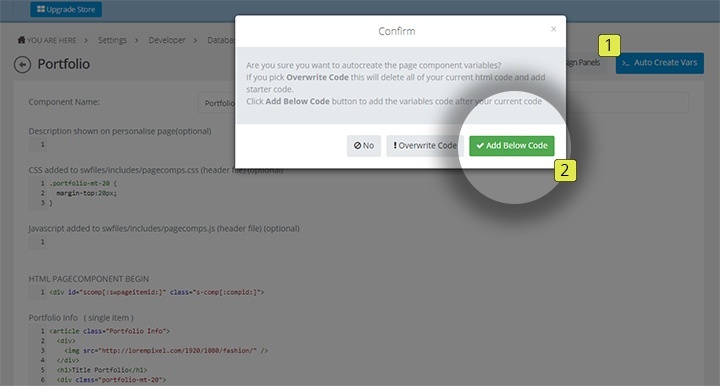 Click Code Editor to return our static html code. In this step we are going to copy paste our variables into our static html code. Now CMS users will be able to edit their own database entries. Place the generated input variables in the corresponding places in the code editor. It is possible that the id's of the variables are different in your project. They should look similar however if you are following this example. Now that we have created our database component you can start creating entries in the CMS using Database Management. (see article).